Carol Noonan's latest album As Tears Go By. Click to Order. We don't want you to run into Irving Potter's place. (in full chorus). Oh, and did I mention it is in my backyard!? There are no restaurants nearby....barely a sign....just mountain views, country roads, and simple neighbors who are in walking distance to see a show. But they are not the only ones coming. The word has gotten out. People are driving three hours to see an artist here. Why? 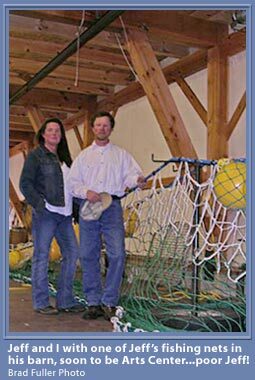 It was opened only 6 months ago by myself , a road weary musician, and my husband a commercial fishing net builder. We are unlikely but yet uniquely qualified to take on this task. He built it, and I filled it.....And it's full alright. Every show has sold out or close to it, even in January. They said it would never fly, no one would come, we were crazy....but ask any performer or audience member alike, and they will tell you there is something special here. The big name artists love the idea of connecting with a small audience again. With a purposeful 21 inch high stage, there is no great distance from the audience to the performer. For most of them it is how they began, for the lesser known artists, it is where they are most comfortable. There is a story here....a story about a town allowing us to do this in my own backyard. A story about a couple reinventing themselves as they approach 50...but the most important story is about how rural people create their own worlds where they live, and the quality of those worlds. It is about the people. If you have read this far, it means maybe you're interested in these people. I have pasted a story below about country legend Marty Stuart visiting our humble little town. It will give you an insight to what I am talking about and what lies in store for you at the Stone Mountain Arts Center! For those of you who missed the Marty Stuart show here at Stone Mountain Arts Center, I am so sorry. I can truly say it is not just the best show I have seen here at SMAC, but it is the best show I have ever seen in my life!! He is a country legend...played with Johnny Cash for years, has won countless grammy and country music awards...is in the country hall of fame, a regular performer on the Grand Old Opry...blah, blah...get the picture? ......he is a big star in the country music world. They got to our always controversial town at 4:00 AM in the morning, and started up our Dugway Road, only to find a tree across their right of way.... a casualty from that crazy storm we had the other night. Anyway, they had to back down a mile of country road, that is not easy to maneuver going forward, never mind a big rig! But being laid back country folk themselves, they pulled into the Brownfield Town Garage unruffled and slept till 8:00. The driver said, there was a moment of panic from the Marty camp, when a few early risers looked out the window and spied the town garage thinking it was the Stone Mountain Arts Center. But soon my Jeff came down and escorted them up a more treeless route to their Blake neighborhood destination. That huge tour bus towing an equally long trailer, came rolling in and they poured out wiping the sleep for their eyes. 12 hours later they were dressed in their spangly jangly country duds, and took the stage. During the day, we shuttled them in a borrowed van from a kind local canoe rental business that said “15.00 a Day" plastered on the side, advertising this band of Southern musicians as if they were for hire. (I wish Marty was that cheap!) They showered and caught some cat naps at the Snowvillage Inn and then requested a place to have lunch and a band meeting at noon time away from the venue. Unprepared of course, I had a moment of panic, but luckily I knew just who to call. I reserved the "function room" in the back of the quaint and colorful Eaton Village Store where Phil treated them to his famous cheeseburgers. I told Phil that I would be picking up the check, and consequently the band racked up a whopping 32.00 worth of sustenance. (Phil waved the room rental ...haha) On the way back, they took pictures of the beautiful foliage and mountains that we get to see everyday. They were amazingly gracious and referred to my husband Jeff and I often throughout the performance. I heard from their agent today, who wanted to book them a return visit right away.....they said that our little place was the best stop on the tour. They said our audience was "powerfully enthusiastic and full of love", and our chef fixed them, and I quote, "the best dang food we ever had on a tour....nice to have some home cookin' for a change!" They commented on what a beautiful dressing room we had, and I admitted to him that we had just finished it the night before thanks again to the help and creativity of friends and neighbors. Marty was very kind and talked to Jeff and I for a long time after the show about our dream, and how important it was. he said we had something very special here, including the audience. It reminded me of why we did this, and why we have risked so much.